I was hesitant to purchase from a large dealer, but the experience was fantastic. Mandy was my sales rep. and she was willing to go above and beyond to answer my questions. I asked her if she would put the Odyssey on the shop lift so I could look the vehicle over and she did so. This which allowed me to see the condition of the van. I was suprised to see that the vehicle was in great shape. This just tells me that the used vehicles sold by KenGarff are as nice as they say they are. I will purchase from Mandy and KenGarff again in the future. I went in to fix a recall on my car and was pleasantly surprised how fast and friendly the service was. As I pulled up, I was immediately greeted and directed on where to go. Then I met with a service advisor, Tony L., who was very friendly and helpful! Also, my car was done faster than I anticipated! Awesome service! Best experience I have ever had buying anything. EVERY SINGLE PERSON there was A+. I was exceptionally lucky to have gotten the salesman I did. Kris Vreeken and he is vreeking amazing!! I have never before bought an brand new car, and so I wanted to go all out. I wanted every add on/ accessory I could get. Kris walked me thru the experience like we were best friends. He showed me what would work for MY lifestyle, and what was unnecessary in what my needs were. He helped me make my car MY car. As we sat in the form fitting seats, I felt even more confident I had made the right choice, and that I was taking that car home that night. Kris not only made things easy, HE MADE THEM FUN!! And that's how a car purchase should be. Easy and fun! I love my car more than any other I've owned. That's because I tailor made it to my specifications, with Kris' help. Never have I met such a genuine guy who made it feel like he was having was much fun as I was! I left there feeling like a had made a friend. Any questions I forgot to ask, I just shoot him a text and problem solved! Next time I am in need if a vehicle, I know exactly where I'm going, Ken Garff Honda downtown, directly to Kris desk. Do yourself a favor and do the same, you'll find yourself thanking me. So in advance I say YOU'RE VERY WELCOME!! THANKS AGAIN KRIS!! Niall Wade is an awesome service advisor!! When I walked in he was busy, but still made a point to let me know he'd be with me shortly. This was my second time working with him- he remembered me from 6 months ago and he was very friendly and transparent. I work at a different car dealership in town, so I know! Niall gave me accurate quotes and time estimates. I felt he genuinely cared about me and my car. Afterwards, he gave me his business card and said "Call me anytime you need anything, if you're stuck on the side of the road, etc." WOW. Side note- I loved the video my technician shared with me while he was inspecting/working on my car! Great experience, 10/10 would recommend Niall. 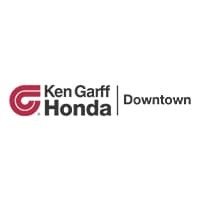 I had a great experience at Ken Garff Honda. They were extremely helpful, answered all my questions, and super welcoming. Best customer service I have ever experienced after the sale.